I've been looking for some "apps" for my phone that would help me identify birds since I generally carry my phone with me. Thus far, I've downloaded both "i Bird Lite" and i Bird Pro. The latter requires WiFi since it houses in excess of 900 birds. The former was insufficient for what I wanted to have access to and learn from as far as an application goes. The latter has a much broader base of birds and only cost a few bucks. So, in the evening when the sun drops behind the trees in the yard, I take my phone outside with me while I sit, relax and keep the dogs company. The past few months, we've had a lot of Eastern Towhees here. They're the ones whose melody sounds like "drink your tea" and are so bold and brilliant in their markings, they're unmistakable. Quite often, I open the "app" and play the calls as they come in to feed. did you notice I went green? After all, green goes with everything. Mother Nature uses it all the time! What a pretty little bird JP. You're getting this mosaic thing down! I do like the soft green. Lovin' the green..and..what a sweet little bird. Great shots of the Towhees! The bird apps sound interesting. I am a new iphone user myself. I may have to give the i Bird pro a try! Thanks for the info. We don't have towhees over here. What branch of bird-dom do they belong to? They have a sort of finch thing going on - but I have no idea how big they are. You seem to be enjoying your summer so much, what with the kayaking, the hiking and meeting new people. I need to get one of those birding programs too, but need the phone first!! what a pretty Towhee!! nice mosaic...and i love the new pastel green...GO GREEN! Bear is not so fond of apps, but loves looking at birds. Glad to see the Tohee; I haven't seen one for a long time. And, yes, green is good. This bird looks abit like an oriole -- it's lovely. Lovely mosaic. 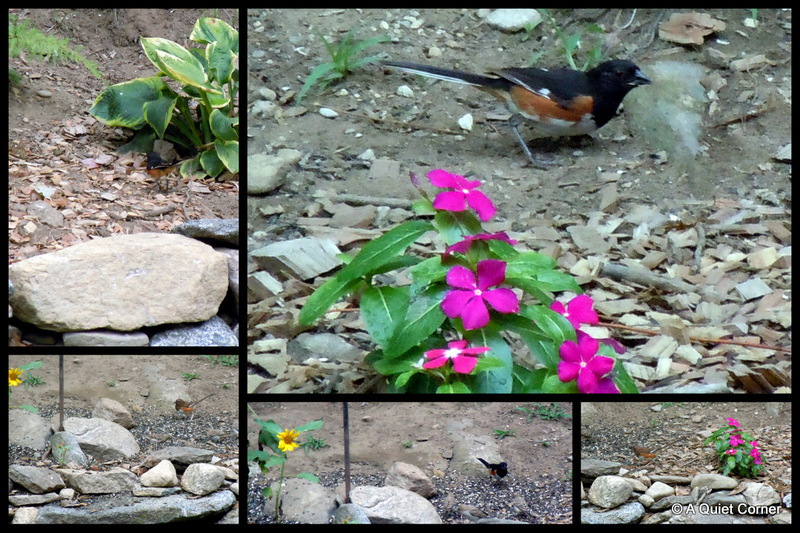 The Towhee couple are pretty. One of my favorite birds to hear and see. Lovely shots. The Towhee is a pretty little bird. Beautiful bird and great shot of him... her... probably a him cause he is so pretty.